Even if you're not a full-time vegetarian, cutting down on eating meat can be good for you health and good for your pocketbook. If you're looking for veggie-friendly meal ideas, then look no further. From pasta to tacos to chili to curry, even the biggest carnivores won't miss meat with these flavorful dishes. Bonus: many of the recipes below are vegan, too! A generous blend of seasoning makes this chili flavorful, but not spicy. 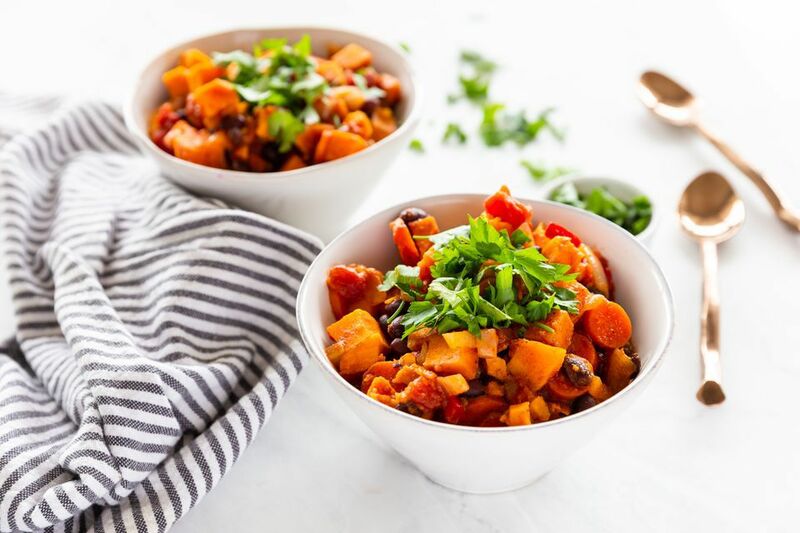 The mix of sweet potato, black beans, and tomato create a filling meal. It’s even more delicious as leftovers the next day after the flavors meld some ore.
You only need a few simple ingredients that are easy to keep on hand for a satisfying veggie lasagna: noodles, frozen spinach, marinara sauce, and cheese. No one will miss the meat with cheesy baked meal like this one. Everyone loves burritos, meat or no meat. Black beans, rice, and spices are all you really need to fill these hefty wraps, but add cheese and some veggies if you like to bulk them up some more. Al dente pasta is tossed with lots of fresh, raw veggies, olives, avocado, and Italian dressing. It’s a classic dish that everyone will love. Add the avocado just before serving to avoid browning. For an extra meaty veggie burger, add mushrooms. They mimic the taste and texture of beef nicely and combined with pinto beans, they make a substantial patty. Get creative with your toppings or go classic with lettuce and tomato. Served cold or at room temperature, this Thai-style pasta salad makes a great summer dinner or an easy lunch any time of the year. The savory, not-too-spicy peanut butter sauce is irresistable. Heart-healthy brown rice is tossed with homemade spinach pesto and combined in a bowl with radicchio, avocado, feta cheese and a soft-boiled egg for a healthy lunch. Double the recipe if you’re cooking for four. For all of the barbecue lovers in your home, serve them a baked BBQ tofu. It’s especially tasty served as a sandwich with toppings like lettuce, tomato, cole slaw or relish. Don't forget to top with extra barbecue sauce. Making falafel at home isn’t as hard as it sounds. With a tender, moist interior and crispy exterior, they’ll be a hit with the whole family. Serve warm as a pita sandwich or as a salad with a tahini dressing. The classic sandwich combination of juicy tomato, sliced mozzarella and basil on fresh bread is a real crowd-pleaser and comes together in just minutes. A drizzle of balsamic vinegar and olive oil are the only condiments needed. With a homemade Thai-style green curry paste, this dish will knock any curry fan’s socks off. A rainbow of veggies makes it a pretty main dish that pairs perfectly with white, brown, or black rice. Just a few simple ingredients and half an hour are all you need to make homemade enchiladas. Add sauteed veggies like spinach or mushrooms to the filling if desired or leave them simply cheesy. Fried rice is a quick dish that’s great for using up leftover grains. Add any mix-ins you want, such as tofu or veggies like cubed carrots, peas, or corn. Frozen vegetables also work great for this recipe. These fajitas come together lightning fast and can be customized with different toppings like cheese, salsa, hot sauce, and sour cream. Mushrooms are a tasty stand-in for beef or chicken. A mixture of black beans, bread, sautéed onions and various spices give these veggie burgers a pleasing texture that everyone will enjoy. Top with cheese if you’re not vegan and all of the usual burger toppings. For an easy and flavorful pasta salad, combine rotini with diced veggies and toss with a sauce of pesto and mayonnaise. It’s creamy, crunchy, and boasts a beautiful green color. A homemade besciamella sauce makes this lasagna extra special, while oven-ready noodles make it extra easy. Serve with a simple salad for a complete meal. Tempeh replaces steak in this vegetarian spin on the classic Philly sandwich. There are onions, peppers, mushrooms and cheese on top with a little steak sauce for added meaty flavor. 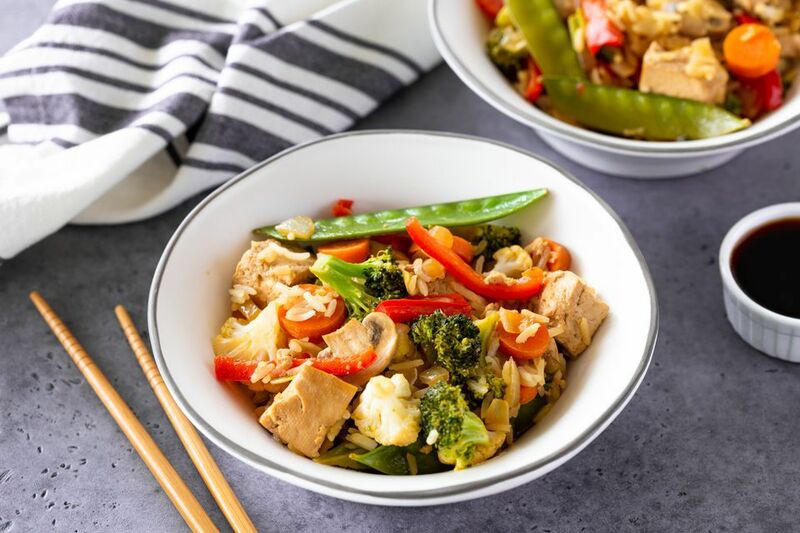 Marinated tofu is stir fried with fresh, colorful vegetables like snow peas, mushrooms, and broccoli in a quick weeknight meal with lots of flavor. Serve atop rice or noodles. This set-it-and-forget-it soup has all of the flavors of tacos in a bowl (without the meat, of course). Serve with crispy tortilla chips and lots of toppings for a fun dinner. Quiche is a versatile dish that’s idea for breakfast, brunch, or lunch, and can be easily customized with up to a cup of diced veggies. Eat it warm or at room temperature and serve with a salad. Get the creamy pasta dish you crave without all of the fat. Low-fat ricotta cheese, milk, and a little Parmesan cheese imitate a sauce typically done with heavy cream. Bright spinach and basil add nutrition and color. Lentil soup boasts lots of protein and fiber, making it a filling and nutritious dish. The hearty soup is also a crowd pleaser, especially when paired with crusty bread for dipping. This curry will taste like you’ve been cooking it all day, but it only takes a few minutes to make. Add spinach or tomato if you like and serve with a simple green salad and basmati rice or naan for a feast. Nutty and chewy bulgur makes an ideal filling for these bell peppers, while tomato, parsley, and basil add savory flavor. If you’re not having a vegan meal, top with cheese a few minutes before baking is finished. No one’s going to be asking where the meat is when you make this eggplant Parm. It’s a classic recipe with breaded eggplant, tomato sauce, and cheese layered together and baked 'til bubbly. Even when low-fat and low-calorie, minestrone soup is still flavorful and filling. Switch up the veggies to suit your tastes and serve with the ultimate soup side dish: warm garlic bread. Everyone’s in for a treat when it’s pizza night. This easy, homemade dough is a delicious blank canvas for your choice of toppings: tomato sauce or pesto, cheeses, and vegetables like spinach, mushrooms, artichokes, or peppers. For a super quick protein-filled main dish for breakfast, lunch, or dinner, turn to the frittata. It’s ready in just a few minutes and can be served warm or at room temperature. Add other veggie mix-ins like sautéed greens if you prefer. A hearty and creamy soup of white beans and pasta, this soothing dish especially good with Parmesan sprinkled on top. Use nutritional yeast if you’re eating vegan.